Born in Quebec city, I have been living in the Outaouais region for over 30 years. I started painting at 18 and have always pursued my passion for the medium. 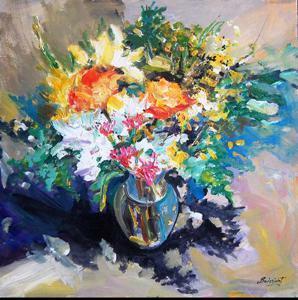 Over my 35 years as a painter, I have participated in many symposiums as well as solo exhibits and many of my painting are found in private as well as public art collections. 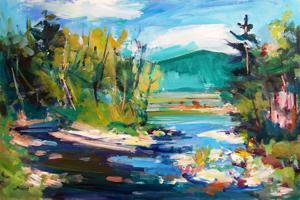 I particularly enjoy painting live and I go regularly in the Gatineau Park and Wakefield area. In studio, my personal search is profoundly linked to colour. Rich, vibrant and pure my palette is particularly fauve. Even though I am constantly concerned with composition and harmony, energy, spontaneity, sensuality and passion are emotions, which are omnipresent in my paintings. Between my full time artist profession and part-time University work, I enjoy sharing my passion by coaching outdoor painting as well as abstract creation. The Artist’s Statement: Transforming Landscape.I believe that my aestheticism originates from my outdoor painting experiences. Live painting allows me to capture the moment’s equilibrium between light and colours, to catch hold of the imperceptible, the invisible and transient moment. 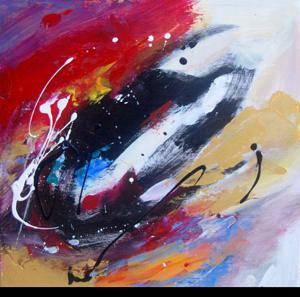 During these magical instances, I paint spontaneously, allowing my emotions to flow on the canvas. In studio, my creative process is inspired by my outdoor painting experiences as well as the collective theories of unconsciousness. The abstract images that I create captivate as they offer a blend of mystery and déjà-vu! There are strong elements of constructive play in my current artwork. 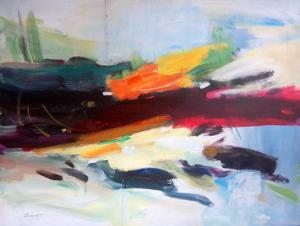 As I start, colours may appear in my head, followed by lines and forms that add up on the canvas… Then, the game begins! At that precise moment, I take time to listen attentively and look closely as to let the rhythm of my artistic flow take it’s place. 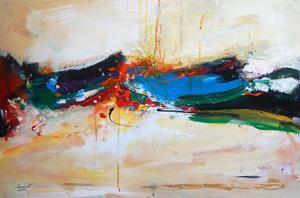 On other occasions, I extract the emotions of my own landscape paintings, and transform them into abstract art. Transforming landscapes is the ultimate results of my current professional path!Technically, when creating abstract, I prefer painting with acrylic as it dries rapidly, allowing my spontaneity to flow freely. 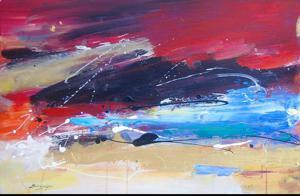 I produce paintings of all sizes but particularly prefer very large canvasses and even wooden panels. Terre de feu #3 "Abstract"
Terre de feu #2 "Abstract"
Entre ciel et terre #1 "Abstract"